Formulated to create patterns of cracks similar to crazing, Crackle Glazes result a unique antique look. To highlight the cracks created in firing, antique the piece with ink, acrylic paint, or a mineral-spirit-based woodstain. Apply a coat of the desired color to the fired piece and wipe off with a soft cloth. Although crackle glazes are nontoxic, they are not practical for food or drink containers because of their surface characteristics. 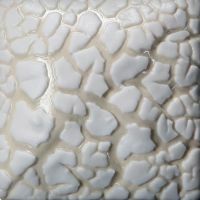 SG501 Sculpting Medium is a dimensional "glaze" that produces a white, raised surface. A great use of Sculpting Medium is to add structured design elements to you work using stencils, lace and stamps. Apply a stencil to your piece, brush Sculpting Medium over the stencil; let the Medium set up a bit and remove the stencil. It has the viscosity of condensed milk and it can be brushed on or applied with a sponge. Sculpting Medium can be applied directly on bisque or ontop of an unfired glaze. The recommended application thickness is 1/16 to 1/8". The fired finish may be coarse and have rough edges; a layer of clear glaze (or a colored glaze) will smooth these sharp edges. Firing range is 05/06: it will not perform at higher temperatures. Cobblestones are non-toxic textural glazes that form raised rectangular chip-like textures when applied over another glaze. 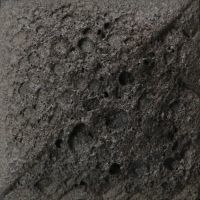 The fired surface will feel rough to the touch; its appearance is reminiscent of dried earth. To achieve the cracked patterns below, apply Cobblestones over any non-toxic glaze. 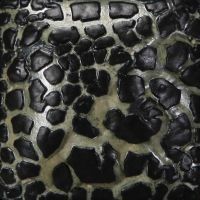 While Cobblestones can be applied over a previously fired glaze, the cracked pattern will become more pronounced if applied on an unfired glaze. Shake for 5-6 seconds before use. Dispense glaze onto a palette (tile, plate, etc.) and apply 2 coats with a broad, soft brush, such as a CB-604 #4 Soft Fan Brush. Apply the second coat while the first coat is still damp: do not allow Cobblestone to dry between coats. These glazes produce special effects when used in combination with other non-toxic glazes. White Cascade intermingles with other glazes being used, introducing pure white to the colors you are using, blending with the color. Clear Cascade produces a flowing effect and allows the color of the base glaze to show through. Apply Cascade over or under non-toxic glaze to create spectacular effects. 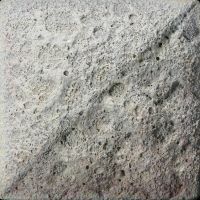 The two Mudcrack glazes are highly textured glazes that form a raised, cracked surface. The two Magma glazes create a rough, cratered surface that becomes thicker with additional applications. Such possibities! Available in pints only. Not dinnerware safe!.